Yes, Domark are at it again! Design a game for their Streetwise label, have it programmed by the lads at Design Design, and become famous! There’s a noise-maker and 50 copies of Butch Hard Guy for the funniest caption in Advance’s competition. Courtesy of Ferguson and CRASH, the first of three opportunities to win a Colour Monitor, Spectrum Plus Two and Monitor Interface. In fact, win the whole kit — a pair of combat trousers, Doc Martens and a CRASH T-shirt, plus 40 copies of the game! Arcades-a-go-go! Our intrepid gamesters travel to Blackpool to find out what’s up on the dedicated action screens. Simon Goodwin tries out Sinclair’s latest gadget, a portable office called the Z88. Lee Paddon talks to ace Australian programmer Steve Taylor, while John Minson explains how Mastertronic bought out Steve’s bosses — Melbourne House. 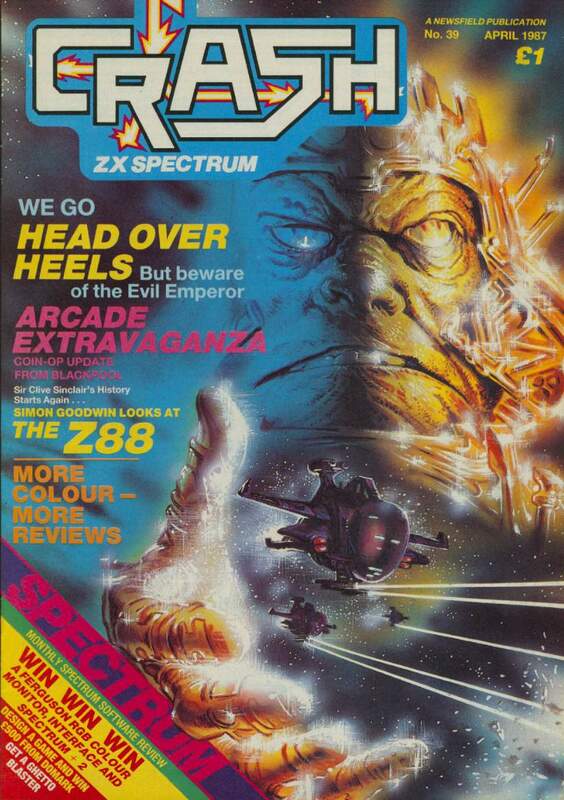 We discover there are prizes behind the Spectrum version of the game. And once again, it’s all change at CRASH Towers, as your new Editor, Roger (Who?) Kean explains. A brief look at the — well, news. With game release bunfights in short supply, the Gonzo Kid turns, in desperation, to serious software for a drinkie. Letter of the Month gets a pay-rise, and a fall of snow keeps Lloyd out of his garden. At Four Minutes to Midnight, and with some Imagination, Derek staggers out of the Red Lion with Growing Pains — and a Mole. As part of the changes, Lloyd Mangram regains his crown and takes over the tipster’s role. Jon Bates takes a look at XRI’s Midi Database and what it means for your synthesiser, and Simon catches up with more of his post. More gore from the sludge of hi-scores. Mummy Minion’s favourite boy gets down to letting you know whether you won, or not. More cramming from the educational front with Rosetta McLeod. Brendan visits the second British PBM convention and reports on the game awards. Loony looms largely, luminously and lucratively. There’s nothing but blood, sweat, tears, toil and trouble ahead for anyone who forgets to buy the next issue of CRASH, on sale from 30 April.